The students have started writing their responses during a writing activity. You wander around the space keeping an eye on their progress, and you notice that perhaps one or two students have barely written a sentence. They are stuck. The words do not flow on to the page. I cannot watch that happen. Some students struggle. Some students lack confidence. I walk up to the student and write a sentence or two in the first person, the beginning of a story, based on the topic of the task. Just before I compose the two sentences I ask the students names that they like and I use those as the basis for the fictional characters that I weave into that opening sentence or two. I then ask the student to finish the story using the ideas in the opening sentences and the knowledge that they possess of the topic. They put pen to paper and the story continues. It is now their story. They are writing. They are thinking. They are getting their ideas down on paper. That is the important thing. A quick head-start. Then a little creativity and a little knowledge. If students stall towards the end I ask them to simply write a dozen or so key words that they can remember. Moments later I then ask them to use the keywords in three or so sentences. Just to keep them writing, thinking. I cannot let the students simply sit there… not writing. Give them a boost, a handle, a hook. Give them some words. Something that they can tap into so that the words will come and the ideas will flow onto the paper. Nationaal Archief / Spaarnestad Photo / Wiel van der Randen, SFA001001739. Kinderen met pen en papier in de schoolbank in de klas. . Plaats onbekend. 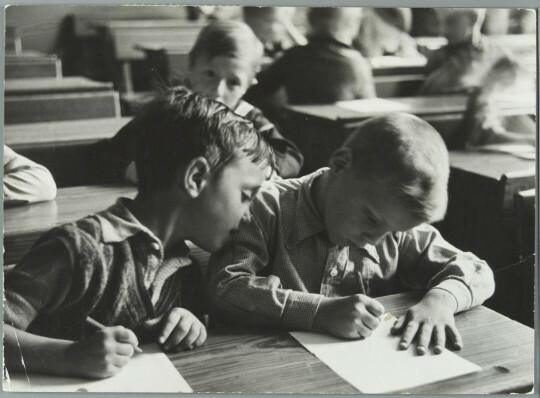 Children / pupils writing on paper with a pen in the classroom. The Netherlands, location unknown. Collectie Spaarnestad.